Counseling within the church context is full of challenges. Knowing what to offer it to your congregation and the boundaries that should exist within your counseling ministry are not intuitive. I have learned this the hard way, over the last nine years, as I have established two different biblical counseling ministry from the ground up. We have made our mistakes, but we have also seen great results as we care for the flock of God at Mission Hills Church and at Grace Chapel. When we begin our counseling ministry at both churches, I decided that it would be a short-term goal-based counseling service. When I first started a counseling centered, I had decided that we would only counsel people for 3 to 5 sessions, and we would be sure are to work toward a goal in every scenario. In some cases, this limited number of sessions still exists. However, I have learned that some cases require a unique level of care, and therefore, the person or couple must meet with the the pastor or counselor a dozen or more times. Determining the right length of counseling for a counselee can prove difficult. That is where David G. Benner’s book was helpful. 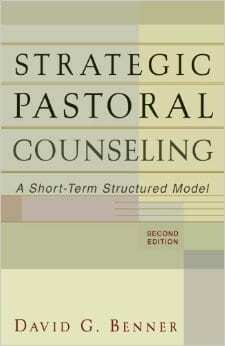 As I begin forming our plan for development of our counseling ministry, I was introduced to “Strategic Pastoral Counseling” by David G Benner. I have benefited greatly from its insights. I have applied it appropriately over the last nine years and are continually refining our application of these valuable principles. I am a true fan of this approach to counseling within the church. Benner prescribes the plan for pastors and church-based counselors to meet with their counselee no more than five times. While I would differ on the length he prescribes (not so much for pastors, but for Certified Counselors), I do see the validity in his argument. It may be best for a pastor to only meet with a person for 4-6 times and then refer them on to a Certified Biblical Counselor from something more intense or specific. Within the sessions of counseling, the counselor must move through specific stages that Benner outlines as necessary and appropriate for the counselee to have the greatest spiritual impact. He does not minimize the role of Holy Spirit or the use of the Bible in his counseling session. I found his writing empowering to the pastor, setting us up to be a tool of transformation used by God in the lives of those in the church. Benner states that “Strategic pastoral counseling is a brief, structured counseling approach that is explicitly Christian, and it appropriates the insights of contemporary counseling theory without sacrificing the resources of pastoral ministry”(Page 74). Brief and time-limited. This parameter requires the counselor to be very intentional from the first contact. Time-limited counseling means that the counselor must be active and directive in each and every session. It means that both parties must continue to work towards the goal in and outside of their meeting time. The counseling must concentrate on one central and specific problem for the length of the counseling partnership. If the relationship does not remain focused, distractions will get in the way of finding true results for the presenting and core issue. It is also important to the counselor the counselee understand each session must have a time limit, and there must be a limited number of sessions when they will meet. Holistic. Strategic Pastoral Counseling looks at behaviors, thoughts, and beliefs when addressing a specific issue. Without keeping these things in mind, it may not be possible for this approach to also be spiritually focused. Structured. Benner states, “Good counseling always involves a good balance of structure and freedom” (page 57). The freedom to follow the Holy Spirit’s leading and address key findings that emerge is an important part of any counseling. However, the counseling relationship that is only based on freedom will result in nothing more than several good conversations or with little to no resolutions. Structure provides focus and guardrails to keep the conversations moving toward a helpful outcome. The structure of the counseling comes out of the work the counselor and counselee do to address the feelings, thoughts and behaviors of the individual. Homework-based Counseling. Momentum is key to seeing results in a short period. In an effort to ensure that momentum is maintained between sessions, the counselee must engage in assigned homework or reading so that the time with a counselor can be highly productive. The homework assignment is always biblically-based, often including the Bible itself. The counselor will assign reading, memorization techniques or process items to help the counselee internalize key principles that will result in behavior modification or new cognitive patterns. Is exclusively church-based. The church is God’s divine institution for spiritual growth, oversight, and accountability. The people in the church understand that the pastor is there to provide wisdom and insight for the believer’s daily living. The congregation should support this ministry of the pastor and find ways to free him up from other administrative duties within the church. He is not starting a private practice counseling service but is rather a fulfilling a vital part of the discipleship strategy within the church body. Spiritually focus. There are many different focuses for which a Christian counselor may choose to turn their attention, but Strategic Pastoral Counseling specifically identifies the spiritual impact the life situation is or has had on the counselee’s soul. The counselor is looking for ways to identify God’s movement in a person’s life and how a person is responding or may respond to this spiritual activity. Explicitly Christian. As Benner explains that Strategic Pastoral Counseling is spiritual, he acknowledges that not all spirituality is Christian spirituality (page 67). The reason the Strategic Pastoral Counseling is exclusively Christian is because of its use of prayer, scripture, and the sacraments. It also has a unique counseling goal to move this counselee closer in their relationship with God so that they may find life, growth, and healing. It encourages them to keep their reliance upon the holy Spirit and to depend upon the word of God for instruction in godliness. I find this model completely energizing and very applicable to my personal ministry. As long as I’ve been a pastor, I have found the demands on my time or high. If I am not careful, urgent things rather than the important things consume my time. The key to caring for my flock well is that I have boundaries on my time. It does not mean that I am inaccessible or unloving to my those in my congregation. Rather, the most loving thing I can do for my flock is to have firm boundaries so that my time allocated to those that need it appropriately. The strategic pastoral counseling model encourages me to set parameters on how I counsel a person towards greater wholeness and holiness. One of the greatest problems in my counseling ministry is that I meet with someone too long or too often. Through David Benner’s approach, I have learned the importance of starting my counseling by stating clear boundaries so that the person understands there will be a limit and a focus to our time. I can do this in the caring manner that lets them know I will still be there for them on-going as their pastor but the counseling relationship must have defined boundaries. Over the last few months, I’ve been starting off my counseling relationships by letting them know we will only meet for a specific number of meetings. I ask them to focus in on very specific issue that they would like to address. We spend time praying and working hard to find God’s perspective and answers for that specific issue. The more clear I am about our boundaries or our focus, the more result I am seeing. I am indebted to Benner for putting clear words on this model and giving practical ways to implement it. By reading this book, I have been reminded of the importance of assigning homework. Because my time is limited, I must disciple the counselee to do work with the Lord outside of their time with me. Assigned homework is not only a great practice for greater productivity in the session; it is a wonderful discipleship method. I want the counselee to be more dependent upon God than on me. By assigning homework properly, I am helping them in their spiritual disciplines to seek God in the quietness of their home. I am exalting Him to be the Wonderful Counselor in their life and for them to see me as an under-shepherd for the one true Shepherd. At Grace Chapel, we have a biblical counseling center (The Hope of Denver) that tends to the flock on a regular basis. For the most part, we offer, what would be classified as “Strategic Pastoral Counseling” by letting our counselees know “we are a short-term goal based counseling center”. We are forthright about our use of prayer and the Bible in our counseling sessions. The counselee understands from the beginning that we are a church-funded, they do not pay for our services, yet they are accountable to the church for their further growth and recovery. In the next few years, we will also work to start other short-term, goal-based ministry programs, such as, Celebrate Recovery, Grief Share, and Divorce Recovery, in order to help people through the specific issues that they are dealing with at a specific state in their life. Strategic Pastoral Counseling is the model we use, and it will continue to be refined as our team grapples with all that David Benner has written. I am grateful for this resource and look forward to seeing it further impact our ministry.